Who doesn’t love a polka dotted motif? The term “polka dot,” dating from 1880-85, is of American derivation, and of course it immediately conjures up a mental picture of a field of spots forming a pattern on a textile. Can you imagine how beautiful this dress was in hot pink with black dots? This two-piece dress could easily be worn today and look very current. 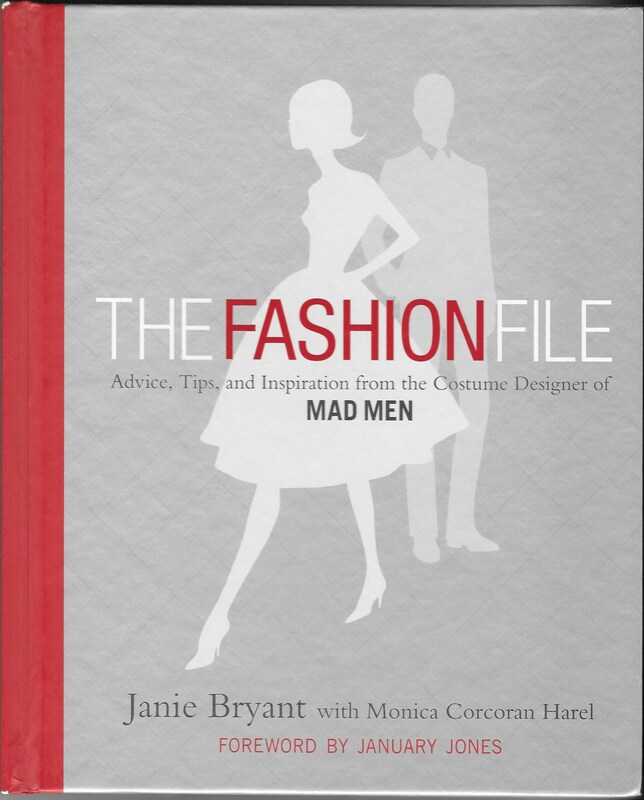 Image from The Fashion File; Advice, Tips, and Inspiration from the Costume Designer of MAD MEN, by Janie Bryant with Monica Corcoran Harel; Grand Central Life & Style, New York, New York, 2010, page 8. Now this is an exhibit I wish I had seen. This is a crepe de chine which I purchased from Britex Fabrics in San Francisco. Smaller irregular dots are woven into the design. The background color is navy blue. Now my hope is that one cannot have a bad sewing day when working with polka dots. Every once in a while unexpected opportunities come along which beg one’s participation. Such was the case on Tuesday evening, November 18. Winterthur Museum in Winterthur, Delaware has been hosting a number of costume designers in a lecture series, as a complement to their “Costumes of Downton Abbey” exhibit, on display through January 4, 2015. 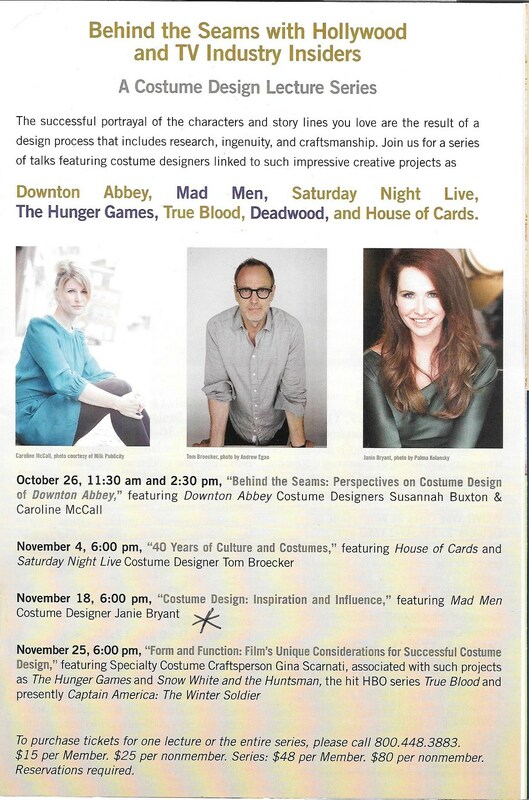 When I read that Janie Bryant, costume designer for Mad Men, would be one of the featured speakers, I quickly made my reservation. Off I went in the frigid cold on Tuesday evening for my 45-minute trek to Winterthur from my home in Pennsylvania. I took with me my copy of Janie’s 2010 book, The Fashion File: Advice, Tips, and Inspiration from the Costume Designer of Mad Men. Taking it off the shelf was like reacquainting myself with an old friend (well, not so old, but it had been a while since I had read it!). Perhaps, I thought, I might get a chance to have her autograph it. In many ways, I credit the costumes of Mad Men as inspiring my return to fashion sewing. It is no secret that the widespread, renewed interest in Mid-Century fashion and design has been a direct result, at least in part, of this television series. The first season was set in 1960, so the elegance and glamour of the 1950s was still very much in evidence. In fact, Janie said she started her research by exploring the late ‘50s’ designs, and used the end of that decade to set the tone for the introduction and development of each of the main characters. In addition, Janie had been fortunate to learn to sew at an early age, making her first dress at age 8. And – she grew up in Tennessee in a family where a true appreciation of fashion, beauty, and ladylikeness was generations long. She brought this sensibility with her as a foundation and inspiration for her position with Mad Men. 1) I was intrigued with her disclosure that she actually used some vintage clothing from her family for some of the Show’s costumes. Betty’s aprons – many aprons! – had belonged to her grandmother! Little details, such as Roger’s monogrammed cuffs, were based on her observations of family members as she was growing up. And did you know that Don Draper’s belt buckle has the initials DD engraved upon it? As Janie said, no one will probably ever see it, but in a very subtle way, it helps to define and enhance his enigmatic character. Sometimes it is the little things in one’s style (and sewing!) that make all the difference. 2) The importance of color in costumes cannot be underrated. For example, the soft color palette (pale blues, pinks, beiges) for the character of Betty helps to reinforce her icy persona, while the deep jewel tones for Joan’s costumes emphasized the power of her femininity. By extension, the power of color in clothing for the rest of us is also a key element in dressing well and in having our clothes work for us, not against us. 3) Several times, Janie mentioned that costumes are so vital in helping to “design” the character. For example, Peggy’s chaste, somewhat prudish demeanor was enhanced by costuming which was reminiscent of schoolgirl dress (bows tucked under collars, pleated skirts, lots of plaid). 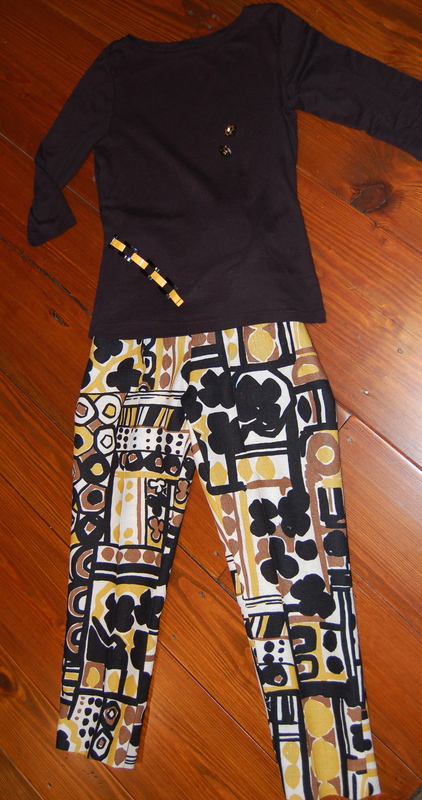 The power of clothing is such that one can change his or her outward persona by altering one’s style of clothing. The flip side of this is that, often, as one grows and becomes more confident, clothing choices become more sophisticated and worldly. 4) Janie said that it is much easier for her to design costumes for characters than it is to dress herself! She admitted to “outfit anxiety” at times, which is probably multiplied for her because of her career and the personal expectations which accompany it. (Hm-m-m-m, I think that’s a problem I wouldn’t mind having!) She has obviously given this idea much thought, and this where I would highly recommend her book. A quick look at some of the chapter headings will tell you some of what you can learn from her observations, her experience, and her expertise: “You as a Leading Lady”, “Defining Your Silhouette and Secrets for Dressing Your Shape”, “The Dressing Room”, “Dressing Chic for Every Occasion”, “The Importance of Being Accessorized”. 5) Which brings me to probably the most important take-away from the evening, at least for me. Without equivocation, Janie wants women to appreciate their own femininity – and their curves! – and strive to feel beautiful in the clothing and accessories they choose and wear. When the package arrived and I finally saw this linen in person, I was – so excited! It was gorgeous – and my suspicions were correct – it was definitely dress-weight. Here is a lengthwise view of the linen. Here is closer view of this amazing pattern. My first thought after my initial euphoria was: This would make up into fabulous ankle-length pants (worn with a black, yellow or khaki top – and of course my black and yellow Bakelite bracelet). And yes, I was sure I would have the nerve to wear them! 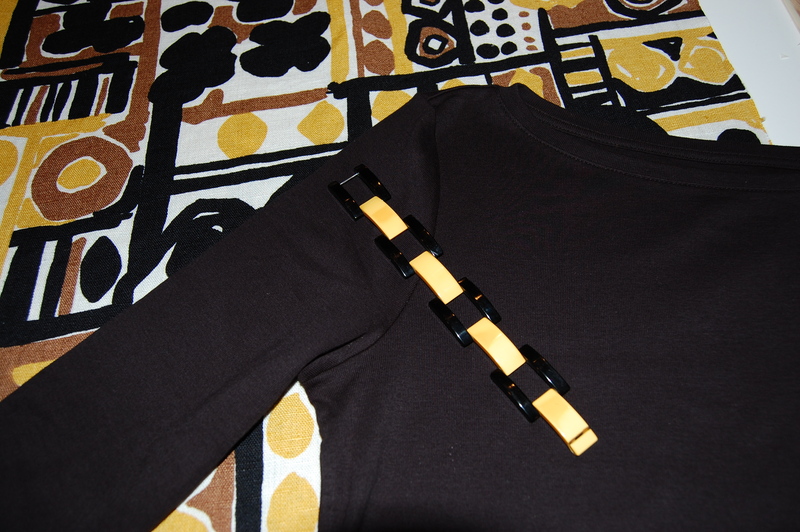 I laid out the fabric with a black cotton knit top and my Bakelite bracelet just to see how it would look. 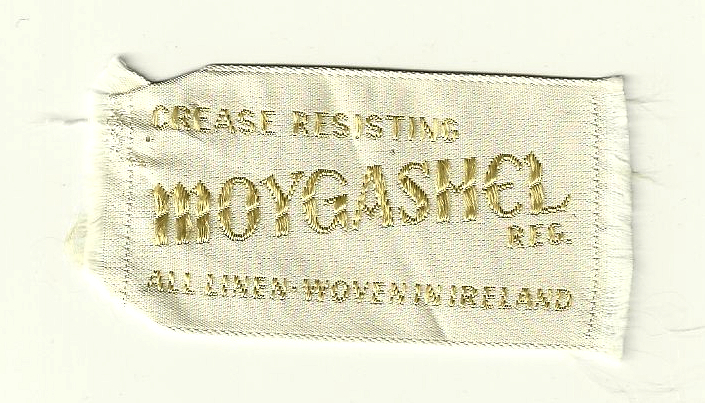 And here is the label which came with the fabric. With my plan in place, I decided this would be my next project after I finished the one I was on. Then something really amazing happened. 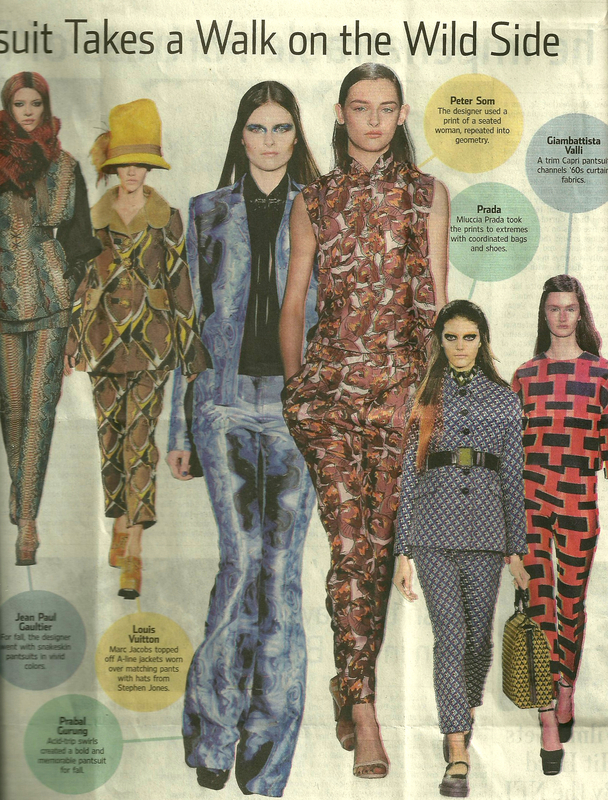 A fashion article in the May 3, 2012 edition of The Wall Street Journal caught my eye. Christina Binkley, one of the newspaper’s fashion reporters, headlined her weekly column “On Style” with The Pantsuit Takes a Walk on the Wild Side. I don’t like any of these fabric designs as much as I like my Moygashel linen! Well, my linen fabric is far from psychedelic, but it is bold – and reading this article certainly did validate my plans for making pants. 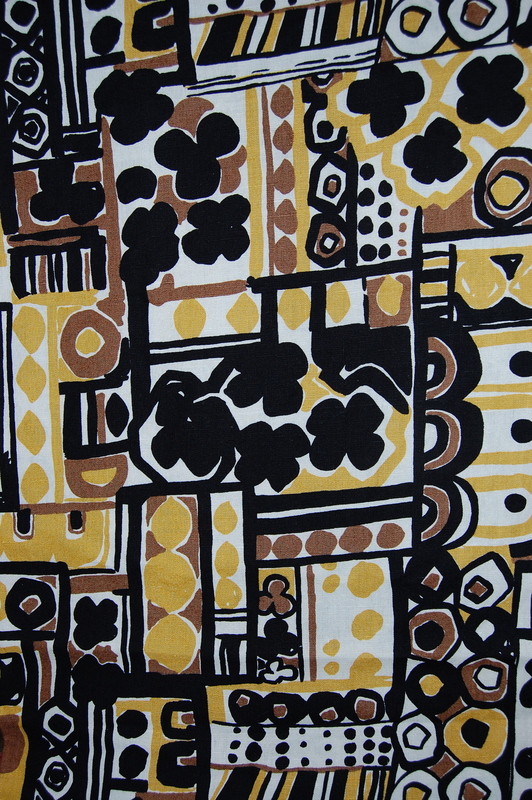 I also already knew the pattern I wanted to use, one quite appropriately from the early to mid ‘60s! 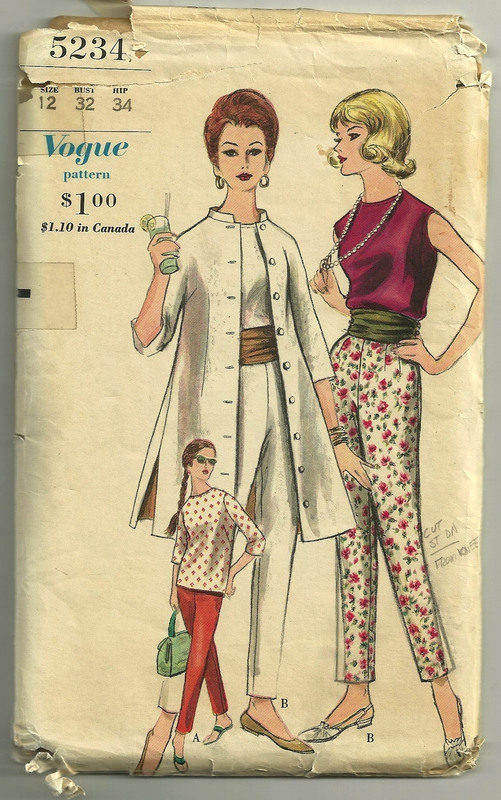 I really like all the styles featured on this pattern – the coat, the two blouse variations, the cummerbund –and the “conservative” pants.Classic looks – all of them! Okay – I was ready to start this project. First I washed the linen in cool water, delicate cycle, and dried it on medium heat. This way I know my pants are totally machine washabIe. Next I made a muslin of the pants pattern to check for fit. I should have done a little more measuring first, as the crotch was too deep and had to be redrawn. Also, although I like slim-ankled pants, these were just a bit too slim, so that was another adjustment. I ended up making muslin #2, which was much closer to the final version from which I cut my pants. However, I had made so many adjustments, that I decided to copy the final pattern onto freezer paper. (Freezer paper is my secret sewing friend – the dull side provides a wonderful surface upon which to draw in pencil and the shiny side can be ironed to fabric to cut out appliqués or anything, really, and then easily removed. And the long continuous roll of paper is perfect for long pattern pieces like pants, coats, etc.) The good news is that now I have a pants pattern that fits really well with the slim, but not too slim, legs that I like. 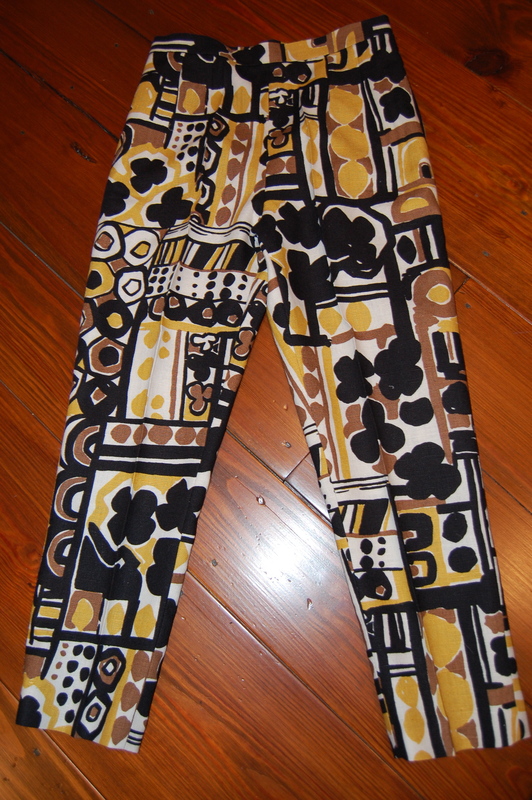 During construction, I tried on these pants about a ga-zillion times. This fabric was just too dear to make any mistakes, and the more I tried them on, the more I liked them. Here they are, all finished. I’d say these are definitely bold! 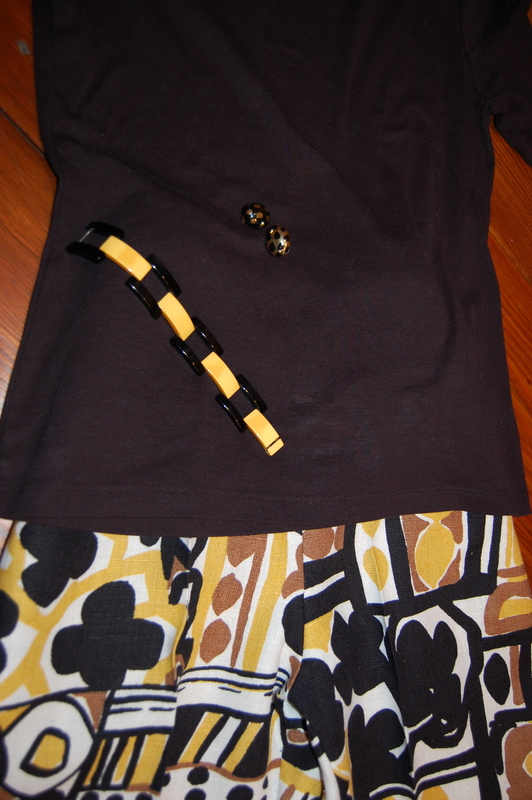 A close-up of same, with the earrings I’ll also wear with this outfit. (Click on the image). 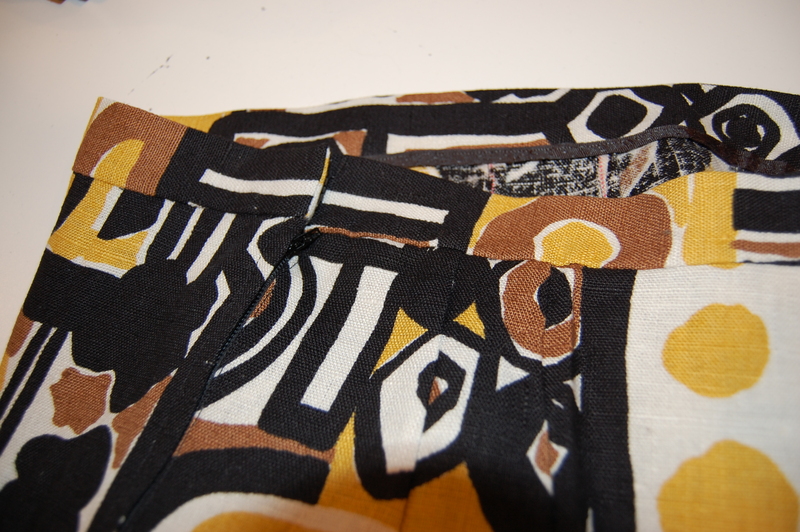 Here is a view of the waistband and zipper. And here is the final touch – the label attached to the inside back of the waistband! 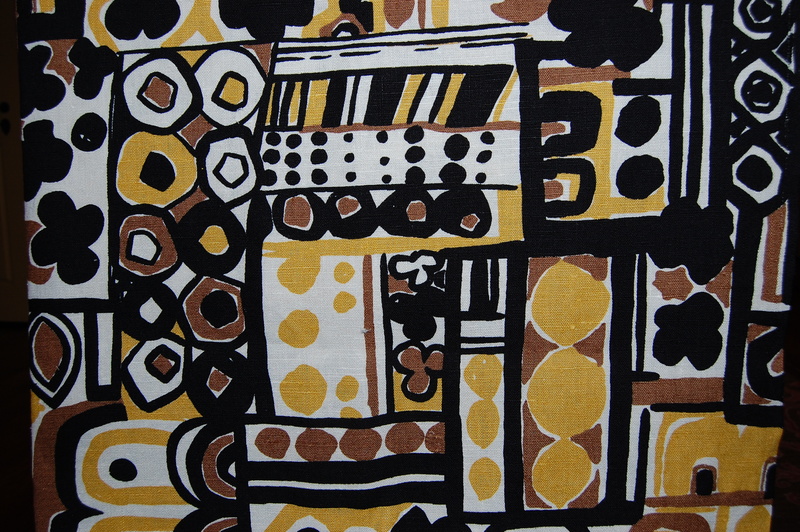 How neat is it to sew something up in vintage fabric, using a vintage pattern – and be totally stylish in 2012? 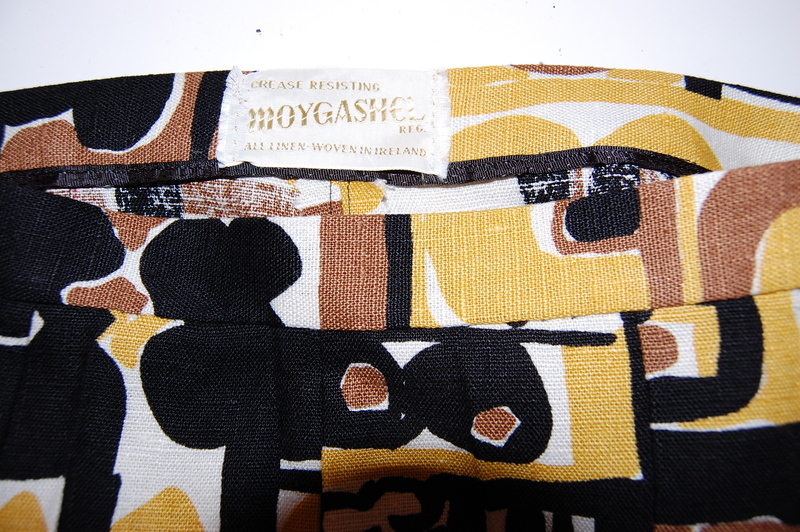 And – I still have enough of this fabric left over to make a skirt. Hopefully that will be very stylish, too, whenever I get around to making it! A couple of years ago my daughter, Susanna, asked me what I’d like to do with the rest of my life. It was a great question – but I didn’t know how to answer it. I did, however, know what I did not want to be doing for the rest of my life – and that was the “full-time” volunteer work that had gradually taken over my days, often my sleep, and certainly my sense of balance in my day-to-day living. But it was more complicated than that. I had to admit that the work I had done and was doing (mostly for The Philadelphia Antiques Show, a major fundraiser for the University of Pennsylvania Hospital) had given me countless friendships, a peculiar source of “identity” and respect, and a sense of accomplishment. I had to figure out if I really wanted to “give that all up” – and if so, what would I replace it with? That was the key question that I could not answer. How I have come to Fifty Dresses is my “rediscovery” story, a crazy concurrence of events which provided me with an answer to that question which I never could have imagined. Mad Men on AMC. The story line is captivating, but it was those early 60’s fashions that really caught my attention. A chance sighting of a book display in a Barnes and Nobel for A Vintage Affair by Isabel Wolff. The cover illustration of 1950’s style prom dresses piqued my interest. I bought the book, loved the story, and it started me thinking about vintage clothing and about many of my clothes from my childhood (which my mother made for me) and from my teens and 20’s (which I made for myself). A random search on Google to find an obscure kitchen item lead me to make my first purchase on eBay, which meant that I had to set up an eBay account and a PayPal account. Once those were in place, I thought I’d do a search for Vogue patterns, then vintage Vogue patterns. I started to dig out old Vogue patterns which I had sewn with in the 1970’s and had kept because I loved them so much. In doing so, I found a beautifully tailored red linen jacket which I had completed except for buttons and handworked buttonholes. I figured if I could sew like that years ago, I could do it again. You’re invited to follow my adventures in sewing from these mid-century patterns and my observations about what I call the Golden Years of Fashion – the 1950s through the 1970s.